Dubliner Stephen Henderson has signed for the Championship club on a free transfer. Henderson at the City Ground. NOTTINGHAM FOREST HAVE announced a three-year deal for Irish goalkeeper Stephen Henderson. The 28-year-old arrives on a free transfer from Charlton Athletic, who were recently relegated to League One. Dubliner Henderson, formerly on the books at Bristol City, Portsmouth and West Ham, spent two years with the Addicks — making 54 appearances. However, he lost his place as number one to Nick Pope in the final two months of last season and will now compete with Dorus de Vries and Dimitar Evtimov at Championship outfit Forest. Henderson, the son of former League of Ireland goalkeeper and manager Stephen and nephew to ex-Ireland stopper Wayne, is uncapped at senior international level but has represented his country at underage right up to U21. 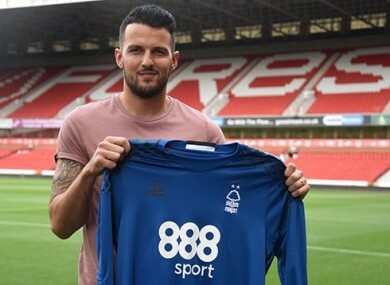 Email “Irish goalkeeper joins Nottingham Forest ”. Feedback on “Irish goalkeeper joins Nottingham Forest ”.